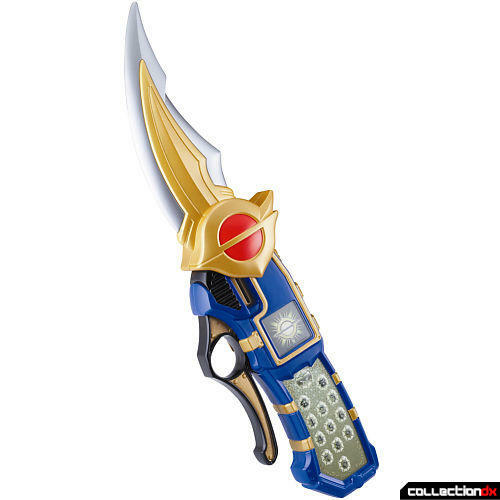 The Solar Cell Morpher (Bandai #25103) is supposed to be a combination Ticket-Puncher and Cell Phone/Morpher. For some reason, US manufacturers have added a soft plastic dagger attachment to the toy, which is something not seen in either the US or Japanese versions of the TV show. The Solar Cell Morpher is slightly smaller than it's Japanese counterpart. 5-1/2" in length; 2-7/16" in width; 1-1/8" deep. It uses 2- AAA batteries and the battery cover is held in place with a single Philips screw. It is mostly dark blue in color. A darker blue than the Japanese version. Almost black. The center of the morpher has a small square emblem under a clear plastic protective cover. Underneath the emblem is a red LED to provide the morpher's only light source. No sound is produced when the Power Switch to the morpher is turned ON. The bottom of the morpher has a keypad for the cell phone with numbers 0-9 and two telephone icon keys, but it's not a real keypad. The US manufacturers have replaced the Japanese soft-touch keys with a decal sticker sheet, so the numbers and icons have no function at all and do nothing. Directly above the keypad is the Mystic Force "M" emblem/logo, which is a real key that activates lights and sounds. Pressing the "M" key causes a "mystical" sound to be heard for 2 seconds and the red LED underneath the center emblem lights up. The Solaris Ranger uses the ticket puncher feature to punch a hole in cards, which in turn summons his train-zord and is used for other abilities. The top of the morpher has a slot for a ticket, or other piece of paper to be placed, but is lacking the ability to punch holes. The Japanese version actually does punch holes and has a compartment to collect the paper discs that can be emptied when full. The morpher has a handle/lever for the ticket puncher and it functions to activate lights and sounds. When the handle is squeezed, a sound that is reminiscent of a steam engine train chugging along is heard and the red LED lights up for 2 seconds. If you squeeze the handle of the ticket puncher and quickly press the "M" key, you hear different sounds culminating in a train whistle blowing. The sounds last for 5 seconds, during which time the red LED flashes. In my opinion, the Solar Cell Morpher doesn't do that much and is not very impressive, but I'm sure that young children would be thrilled to have anything related to the show. For a look at the Japanese version of this morpher, please see my review of it elsewhere at this web site.